The new 41DS marries a deck saloon layout with its raised living space amidships, large windows and private cabins forward and aft, to a proven hull with fine sailing qualities. This large-volume builder stands squarely in the upper middle class of the construction world. The glass work is excellent, the joinery fits perfectly and all the systems are installed properly. It&apos;s not a custom vessel with elaborate detailing, but a sound, attractive boat with things just done right. Our test boat was built in France, but all future 41DS models will come from the company&apos;s newly expanded factory in Marion, South Carolina. For years, the U.S. factory only built hulls and did the final assembly of parts shipped from France. But now even the CNC machinery for cutting interior joinery is in that facility. The hull is solid fiberglass, while the deck is cored with balsa. Polyester resin is used throughout. I found neat, smooth glass work everywhere. The electrical and plumbing systems were equally neat and made of high quality materials. Like most European production boats today, the keel ballast is cast iron. Batteries and tanks live below the raised saloon sole, keeping that weight down low for better stability. I found good engine access through panels under the steps and in the aft cabin. Jeanneau deserves applause for its owner&apos;s manual, the best I have seen for any boat. It covers all the systems and factory options thoroughly, and is filled with gorgeous color drawings that lay out the innards in wonderful detail. 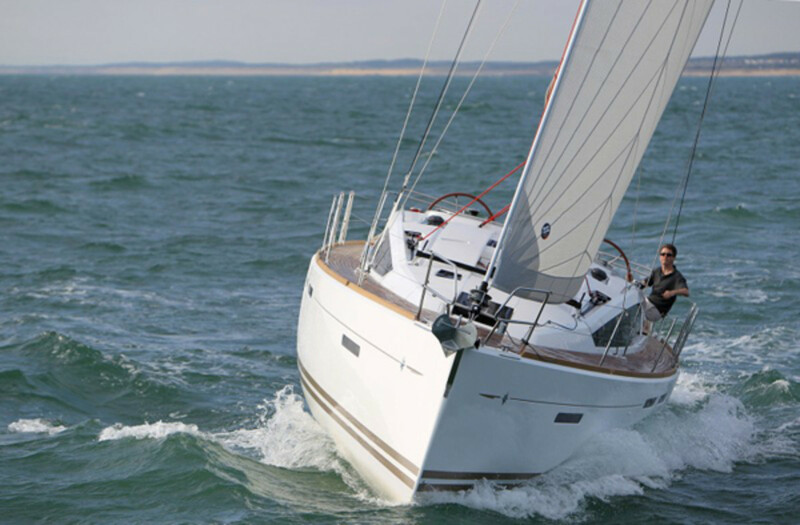 The Jeanneau 41DS is set up for easy handling by a couple or singlehander with average strength and agility. Our test boat had the standard in-mast mainsail furling and a 106 percent self-tacking jib, along with electric Harken Rewind winches, which pay out the sheets as well as trim them in at the press of a button. The tall mast, small jib and rolled mainsail combination makes sailing almost effortless for skippers who are comfortable with a bit of technology. Naturally, the traditional mainsail, which includes an additional 90ft² of sail area, will provide more power, but of course, this comes at the physical cost of hoisting and furling canvas manually. There&apos;s a good arrangement of sheets and other control lines, with everything both marked and color-coded. I especially appreciated the excellent line tail stowage in bins beside the winches and under the bridgedeck. This is a detail many boatbuilders often overlook. 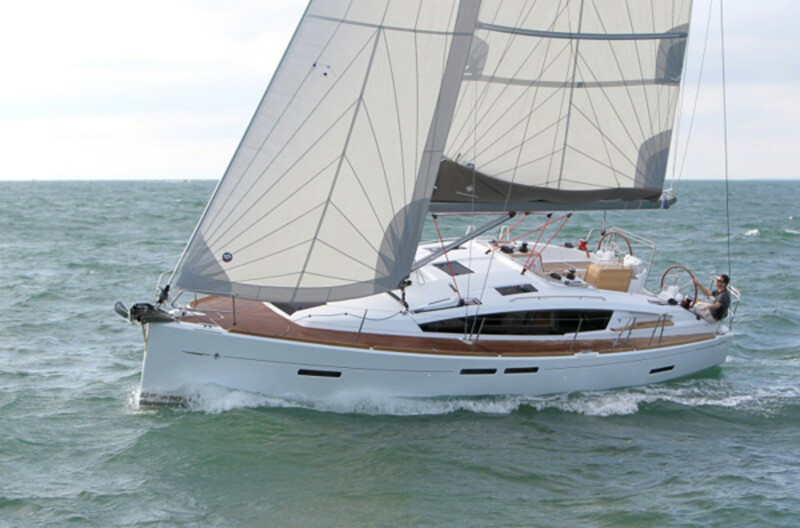 The Jeanneau 41DS is set up for a couple to cruise either alone or with occasional guests. There&apos;s no attempt to cram in a bunch of berths for charter operation, and the company plans no other interior versions. As you descend into the saloon, a modern, sleek, bright environment greets you. The wood is in a medium tone, the overhead and hull ceilings are padded, and all the joinery fits precisely. Open one of the numerous lockers and you will discover that what appear to be magnetic catches are, in fact, mechanical. Sliding shades regulate light through the ports and hatches. Sit at the nav station and you find space for a laptop computer in one compartment and room for a chartbook or other traditional nav tools in the other. Stretch out on the comfortable portside settee/chaise to enjoy your latest copy of SAIL magazine. Somebody on the Jeanneau design team is tall. My 5ft 2in wife could not reach the overhead grab rails, but she found the countertop fiddles and other grab points convenient underway and commented that the companionway was exceptionally safe and secure. Deck saloon boats have a slight step-down as you go either forward or aft, so you will have to learn to be aware of that to avoid a jolt. 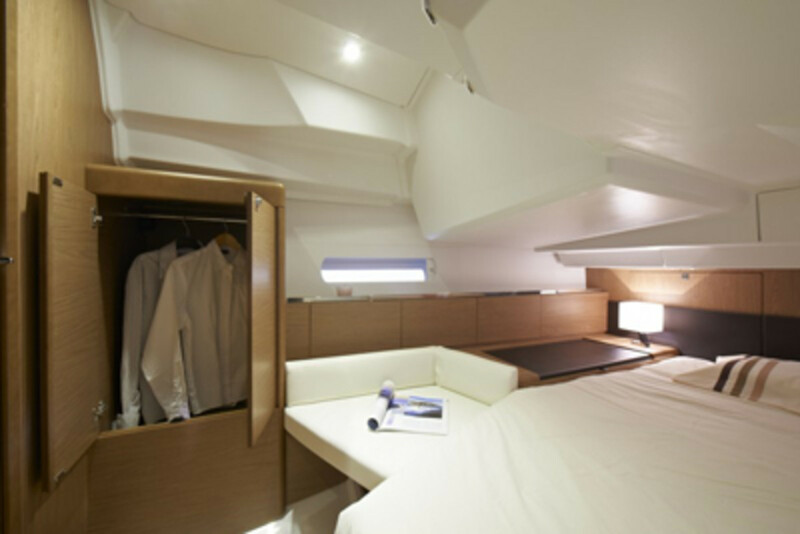 The two sleeping cabins are conventional and comfortable, with good headroom in the aft cabin as a nice result of the raised bridge deck. The aft head compartment is practical, but a bit complicated to use, and I had to do a bit of fiddling and twisting to work the clever transparent plastic partition that walls off the shower from the toilet and sink. In a 6- to 8-knot breeze off Annapolis, the 41DS returned 4.5 knots on a beam reach. This seems respectable for a fully equipped cruiser and the feel of the helm and responsiveness of the boat were quite pleasant. Tacking angles were below 90 degrees and setting sail, furling, tacking and changing course were delightfully simple. Visibility was also excellent with clear sight lines from any place I chose in the cockpit. I appreciated the efficient arrangement of sheets and other control lines and everything was marked as well as color-coded. It&apos;s easy to get to know this boat, but be warned that the high-aspect rig provides an air draft of about 62 feet. You will therefore have to choose masthead accouterments, like antennas and wind sensors, with care to avoid exceeding the magic 65ft clearance that is standard for most highway bridges in the United State. As it did under sail, the 41DS revealed very nice handling under power, turning in a one-boatlength circle. It stopped without fuss and backed almost perfectly straight without any significant rudder kick. The standard three-blade prop proved a good match to the engine with a cruising speed of 7.5 to 8 knots at 2800 rpm. It reaches its limiting hull speed without working the engine hard. The cruising sound level was modest at 77 dBA. Jeanneau offers its optional “360 Docking” system for skippers who want the ultimate maneuverability in exceptionally crowded marinas, but I was pleased with the conventional drive system. 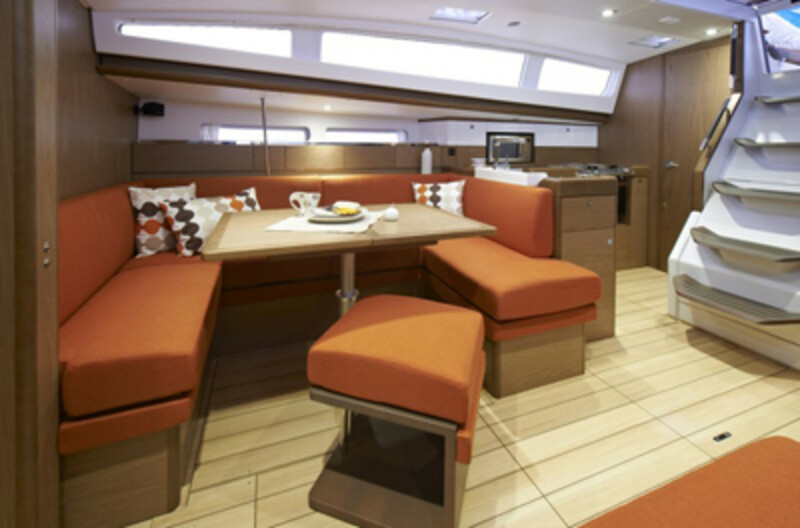 While 40 feet is about the minimum size for the deck saloon layout to function well, Jeanneau has created a spacious, comfortable interior, an efficient deck layout for shorthanded sailing and attractive appearance in their 41DS. Add easy handling and sound construction and the result is a winner. PRICE $239,000 base includes sails, furling mast, self-tailing winches. Less ground tackle, electronics.